Stopping child abuse and sexual assault is an effort that extends far beyond the borders of Greenville County. 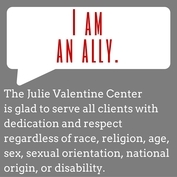 Julie Valentine Centers and its individual programs enjoy affiliations and memberships with a variety of organizations and federal agencies that are working with us to end these crimes against our friends, coworkers, family and neighbors. Click on the links below for more information, resources, safety tips and other ways in which you can become a key player in stopping sexual assault and child abuse.